If you haven’t figured it out already (or if you’re new here), this blog is often a place where I explore things I was taught growing up & how I’ve moved away from some of those things as I’ve become an adult. This isn’t easy for me because, whether by nature or by nurture, or more likely some combination of the two, I am a bit of a people-pleaser. I like to help others & to make people happy. It’s never come naturally to me to rock the boat, & thus I try to avoid confrontation as much as possible. However, one of the best things about being a nurse is that it has forced me to become a lot more assertive & thus be less afraid of confrontation. Furthermore, it has helped me understand that life is far too short to be anything but happy, & that Shakespeare’s words “This above all, to thine own self be true” were indeed very wise. The older I get, the less I care about pleasing everyone else in my life because I’ve realized that I can never please everyone anyway. And at the end of the day, no one owns my life except me, so it’s best to just be honest about who I am & what I believe & let the cards fall where they may. That was a long preamble, but I’ve said all that to explain why today’s blog post is kind of a big deal for me. 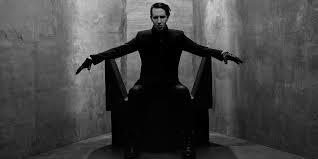 One of the things I learned growing up was that Marilyn Manson was more or less the personification of evil, Satan incarnate if you will. 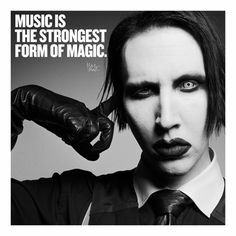 As someone who seems to have made a career out of making people uncomfortable & rocking the boat in every possible way, quite often it seems just for the hell of it, Manson is someone that for most of my life I just couldn’t understand. I still vividly remember the first time I heard his version of Sweet Dreams & was mildly horrified to find that I loved the song. I was driving to Blacksburg to visit my then-boyfriend/now-husband when the song came on the radio. It was dark outside & I have to admit the song sent chills down my spine. And yet I loved it. At the time I was vaguely familiar with a few of his other pieces like The Beautiful People & The Dope Show, but none of them had ever intrigued me enough to really investigate him further or see past his “devilish” image (both literal & metaphorical). It’s only in the past few weeks that I’ve really started to read up on Manson & try to understand him as an artist & a person, which was triggered when I read an interview with him about his new album in Revolver magazine & was surprised at the maturity & wisdom in his words. 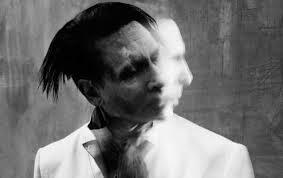 Manson’s latest album, which just debuted in January, is very bluesy & quite different than much of his previous work. Definitely worth a listen even if you’re not normally a fan of his music. 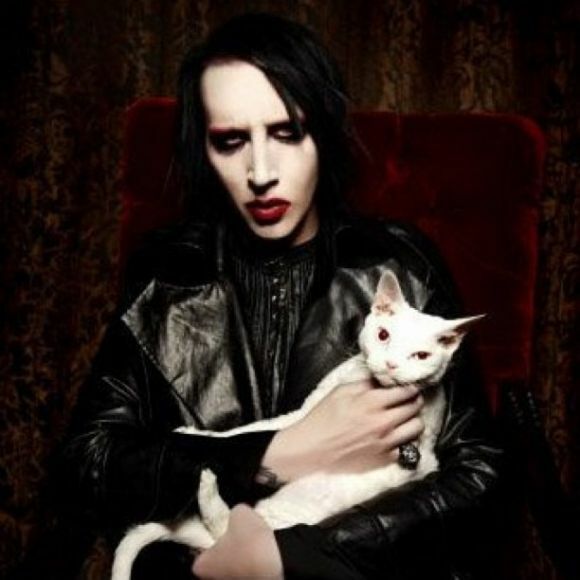 To be clear, I’m still not a fan of some of Manson’s antics from his heyday back in the 90s (stuff like urinating on fans & masturbating on stage). 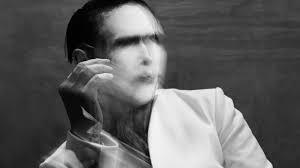 But if you read some of his more recent interviews or listen to his latest album, The Pale Emperor, it quickly becomes apparent that Manson has matured a great deal. I’ve also just recently seen his interview in Bowling for Columbine & read some of the articles he wrote in response to that tragedy, & I’ve found myself nodding along in agreement with every word he said. If you were to talk directly to the kids at Columbine and the people in that community, what would you say to them right now? 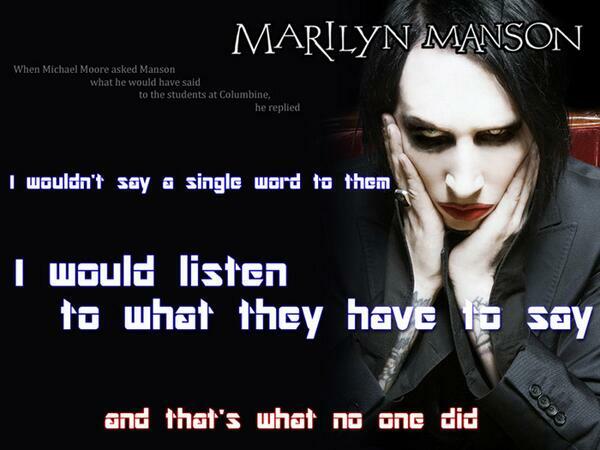 The following are quotes I really like that are attributed to Manson, but FYI I can’t find direct sources for them. 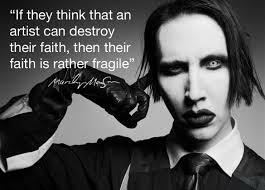 In the end it seems that maybe Manson isn’t so evil after all . . . or at least no more so than any of the rest of us. And maybe that’s exactly what he’s being trying to show us all these years.